2016 Update: A new product (Native Barcode Generator for Excel) has been released since this question was resolved that offers an easier method of generating barcodes in Excel. The Developer Tab includes tools to import ActiveX Controls and VBA files. 2. Right-click on the File menu tab. 3. 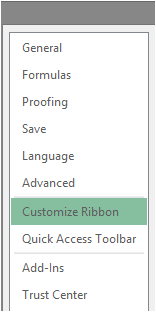 Select Customize Quick Access Toolbar. 5. Place a check in the Developer option. 7. 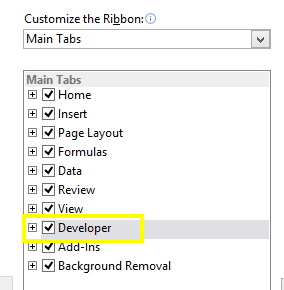 Select the Developer Tab.